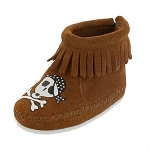 You're never too young to enjoy the functional comfort of a great pair of Minnetonka moccasins and as active as kids are, the strong durable form and quality craftsmanship of a Minnetonka moccasin definitely comes in handy for children. 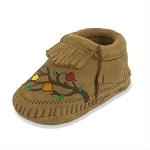 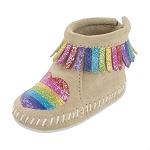 At Moccasins Direct, we carry the world's most reputable children's moccasins, girl's sandals and babies and infant footwear "Minnetonka Moccasin" in a wide range of attractive styles and colors for kids. 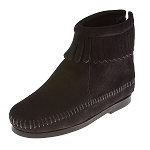 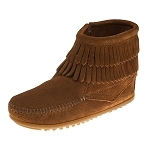 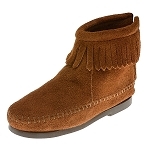 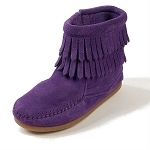 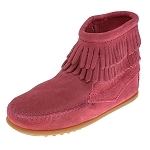 Going back to school or just keeping cool; a gorgeous pair of Fringe boots are always a big hit for the girls; from super soft pile-lined soft-soled slippers to boldly laced and tassled Tramper boots, there is a style of moccasin, sandal or boot sure to match any kid's young and fashionable taste at a seriously low price that will match any parent's budget at Moccasins Direct.